Damon Hill won the Formula One World Championship with Williams. The 1996 FIA Formula One World Championship was the 50th season of FIA Formula One motor racing. The championship commenced on 10 March 1996 and ended on 13 October after sixteen races. Two World Championship titles were awarded, one for Drivers and one for Constructors. Damon Hill won the Drivers' Championship two years after being beaten by a point by Michael Schumacher, making him the first son of a World Champion (his father Graham having won the title in 1962 and 1968) to have won the title himself. 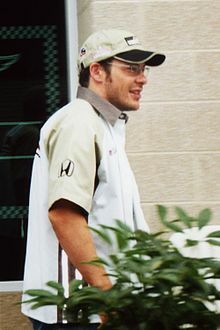 Hill, who had finished runner-up for the past two seasons, was seriously threatened only by his teammate, newcomer Jacques Villeneuve, the 1995 IndyCar and Indianapolis 500 champion. Williams-Renault easily won the Constructors' title, as there was no other competitor strong enough to post a consistent challenge throughout the championship. This was also the beginning of the end of Williams's 1990s dominance, as it was announced that Hill and designer Adrian Newey would depart at the conclusion of the season, with engine manufacturer Renault also leaving after 1997. Two-time defending world champion Michael Schumacher had moved to Ferrari and despite numerous reliability problems, they had gradually developed into a front-running team by the end of the season. Defending Constructors' Champion Benetton began their decline towards the middle of the grid, having lost key personnel due to Schumacher's departure, and failed to win a race. Olivier Panis took the only victory of his career at the Monaco Grand Prix. The numbering system used since 1974 was dropped. Ferrari was given the numbers 1 and 2 after hiring the defending champion Michael Schumacher, despite finishing the previous year's Constructors' Championship in third, Benetton received numbers 3 and 4 for winning the Constructors' Championship, Williams got numbers 5 and 6 for finishing second, McLaren got 7 and 8 for finishing fourth, Ligier got 9 and 10 for finishing fifth, and so on. The following teams and drivers competed in the 1996 FIA Formula One World Championship. Forti Grand Prix were declared bankrupt after the British Grand Prix and took no further part in the championship. By receiving an Italian licence the defending Constructors' Champion Benetton officially became an Italian constructor, though continued to be based in Britain. Jordan gained a new title sponsor in British cigarette brand Benson & Hedges, who joined oil supplier Total and engine company Peugeot in the team's official name. Meanwhile, Tyrrell lost their title sponsor, Finnish communications company Nokia, becoming officially known simply as Tyrrell Yamaha. Forti also lost the sponsorship of Italian dairy corporation Parmalat, as well as any official connection to Ford, although they continued to use Ford engines. Scuderia Italia decided to end their two-year working relationship with Minardi, so the team once again became known simply as Minardi Team. Two teams disappeared from the entry list entirely. Larrousse had missed the early races of 1995 before finally announcing their withdrawal before the San Marino Grand Prix. Gérard Larrousse claimed several times the team would reappear in 1996, but a combination of legal and financial difficulties meant this never materialised. Pacific withdrew from the sport at the end of 1995. Defending champion Michael Schumacher left Benetton for Ferrari, citing the need for a new challenge. He displaced Jean Alesi, who moved in the opposite direction. Gerhard Berger was offered the chance to stay as Schumacher's teammate, but eventually opted to join Alesi at Benetton. Ferrari filled the seat with Jordan's Eddie Irvine. Berger's decision to join Benetton ousted Johnny Herbert, who joined Sauber alongside Heinz-Harald Frentzen. Sauber's other seat had been filled in 1995 by both Karl Wendlinger, who left F1 still struggling to recover fully from injuries sustained at the 1994 Monaco Grand Prix, and Jean-Christophe Boullion, who returned to his testing role at Williams. Williams dropped David Coulthard, instead recruiting Canadian rookie Jacques Villeneuve, who had won the 1995 CART Championship, to partner Damon Hill. Coulthard joined McLaren alongside Mika Häkkinen, replacing Mark Blundell, who moved into CART with PacWest Racing. Martin Brundle left Ligier in order to replace the Ferrari-bound Irvine at Jordan, where he would partner Rubens Barrichello. Ligier replaced him by bringing in Forti's Pedro Diniz alongside Olivier Panis. Aguri Suzuki, who had shared Brundle's seat in 1995, left F1 altogether. Footwork had an entirely new line-up in 1996, dispensing with all three of their 1995 drivers. Gianni Morbidelli became a test driver for Jordan, before returning to a race seat in 1997 with Sauber, while fellow Italian Max Papis moved to America to race in the CART Series. Taki Inoue was rumoured to have secured a drive with both Tyrrell and Minardi, but ultimately lost out on both seats and moved to sports cars. Footwork replaced them with Jos Verstappen from the now-defunct Simtek team, and 1995 International Formula 3000 runner-up Ricardo Rosset. Simtek's other driver, Domenico Schiattarella left F1 completely. Luca Badoer moved from Minardi to Forti, replacing Pedro Diniz, who had gone to Ligier. As his replacement, Minardi brought in Giancarlo Fisichella, who had been racing with Alfa Romeo in the International Touring Car Championship, to partner Pedro Lamy. Badoer's teammate at Forti would be Andrea Montermini, who had raced for the now-extinct Pacific team in 1995. He replaced Roberto Moreno, who moved into Champ Car. Tyrrell was the only team on the grid with an unchanged line-up from 1995, in Ukyo Katayama and Mika Salo. Due to his commitments with Alfa Romeo in the International Touring Car Championship, Giancarlo Fisichella missed several races for Minardi. European Formula 3000 driver Tarso Marques raced at the Brazilian and Argentine Grands Prix, while Giovanni Lavaggi, who had raced for Pacific in 1995, replaced the pair of them from the German Grand Prix onwards due to his superior financial backing. Forti were declared bankrupt after the British Grand Prix, leaving both their drivers out of a drive. Luca Badoer would eventually return to F1 in 1999 with Minardi, after a spell in the FIA GT Championship, while Andrea Montermini became a test driver for the short-lived Lola team in 1997. The race weekend schedule was changed for the 1996 season compared to 1995. The number of free practice sessions was increased from the two to three with the number of laps allocated for each day increased from 23 to 30. Also, to increase the spectacle, the Friday qualifying session was dropped, with the FIA World Motor Sport Council opting to have only one qualifying session, held on Saturday afternoon. The previous system of having a red and green light to start the race was replaced by the current system of five red lights turning on sequentially, then all going out simultaneously after an indeterminate period of time to start the race. This year saw the introduction of the "107% rule", which meant all cars had to be within 107% of the pole position time in order to qualify for the race. A new numbering system for cars was adopted for 1996 and remained in place until the end of 2013, when a new system was introduced. Previously, the reigning Drivers' Champion's team had simply swapped car numbers with the previous Drivers' Champion's team to carry numbers 1 and 2, with all other teams retaining their existing numbers. For 1996 the reigning Drivers' Champion was given number 1 and his teammate number 2 with the rest of the teams numbered in the order of their finishing position in the previous year's Constructors' Championship. Any new teams were allocated the following numbers. In 1995, the cars' cockpit opening was made larger and the sides were raised in order to provide better head protection for the driver; these sides were raised even higher (to mid-helmet height) for 1996, along with a wraparound head restraint made of foam to prevent head injuries such as those suffered by Mika Häkkinen during qualifying for the 1995 Australian Grand Prix. Needle-like nosecone designs with a sharp point, such as the 1995 McLaren MP4/10, were also banned in favour of more blunt nose sections. Damon Hill won the season opener from Williams' teammate Jacques Villeneuve with Ferrari's Eddie Irvine finishing third. Villeneuve was leading but late on in the race the team found out that Villeneuve had an oil leak and order him to swap places with teammate Hill. Points are awarded to the top 6 classified finishers in each race for the drivers and constructors championships. ^ a b service, Grandprix com-First & fastest: The original online F1 news. "The 1996 F1 calendar". www.grandprix.com. Retrieved 5 February 2019. ^ a b c d "1996 • STATS F1". www.statsf1.com. Retrieved 5 February 2019. ^ "1994 • STATS F1". www.statsf1.com. Retrieved 5 February 2019. ^ "Like father, like son - the second-generation F1 racers". Formula 1® - The Official F1® Website. Retrieved 5 February 2019. ^ "Damon HILL • STATS F1". www.statsf1.com. Retrieved 5 February 2019. ^ a b c "Hill on Villeneuve | Motor Sport Magazine Archive". Motor Sport Magazine. 7 July 2014. Retrieved 5 February 2019. ^ "Williams admits mistake to let Newey go". www.motorsport.com. Retrieved 5 February 2019. ^ "The rise and fall of Williams". www.racefans.net. Retrieved 5 February 2019. ^ Weeks, Jim (18 February 2016). "Schumacher and Ferrari: The Launch of F1's Greatest Partnership". Sports. Retrieved 6 February 2018. ^ "Working Within Benetton During the 1990's". UNRACEDF1.COM. 31 July 2018. Retrieved 6 February 2019. ^ "Benetton • STATS F1". www.statsf1.com. Retrieved 6 February 2019. ^ "Olivier PANIS - Wins • STATS F1". www.statsf1.com. Retrieved 6 February 2019. ^ "Numbers Nostalgia". F1 Colours. 12 November 2010. Retrieved 7 January 2019. ^ a b "1996 FIA Formula One World Championship Entry List" (PDF). FIA.com. Fédération Internationale de l'Automobile. 4 December 1995. Archived from the original (PDF) on 2 March 2005. Retrieved 28 July 2015. ^ "1995 • STATS F1". www.statsf1.com. Retrieved 7 February 2019. ^ "Models in 1996 • STATS F1". www.statsf1.com. Retrieved 7 January 2019. ^ "All the drivers 1996 • STATS F1". www.statsf1.com. Retrieved 7 February 2019. ^ "Gallery: F1 teams that became defunct in the last 25 years". www.motorsport.com. Retrieved 7 February 2019. ^ "Benetton to race under Italian colours". New Straits Times. 29 November 1995. Retrieved 4 February 2014. ^ "Jordan to be sponsored by Benson and Hedges". www.motorsport.com. Retrieved 7 February 2019. ^ "Tyrrell loses Nokia". grandprix.com. 18 December 1995. Retrieved 7 February 2019. ^ "Larrousse's last months as F1 Team". UNRACEDF1.COM. 28 July 2018. Retrieved 7 February 2019. ^ "The untold story of Pacific Grand Prix in the F1". UNRACEDF1.COM. 19 November 2017. Retrieved 7 February 2019. ^ a b "Schumacher signs for Ferrari". www.motorsport.com. 8 May 1995. Retrieved 7 February 2019. ^ a b "Berger signs for Benetton". grandprix.com. 4 September 1995. Retrieved 7 February 2019. ^ "Irvine to partner Schumacher at Ferrari". The Independent. 27 September 1995. Retrieved 7 February 2019. ^ "Herbert signs for Sauber". The Independent. 19 December 1995. Retrieved 8 February 2019. ^ "Karl Wendlinger signed by Sauber". www.motorsport.com. Retrieved 8 February 2019. ^ "BBC - A Sporting Nation - David Coulthard's best season 2001". www.bbc.co.uk. Retrieved 8 February 2019. ^ La-Croix.com (30 September 1995). "FORMULE 1 L'Irlandais Martin Brundle, qui pilote cette saison une Ligier, rejoindra en 1996 le Brésilien Rubens Barrichello au volant d'une Jordan-Peugeot". La Croix (in French). Retrieved 9 February 2019. ^ "Pedro Diniz | Motor Sport Magazine Database". Motor Sport Magazine. 12 June 2017. Retrieved 9 February 2019. ^ "Ligier - Seasons • STATS F1". www.statsf1.com. Retrieved 9 February 2019. ^ "Aguri SUZUKI • STATS F1". www.statsf1.com. Retrieved 9 February 2019. ^ "Footwork - Seasons • STATS F1". www.statsf1.com. Retrieved 9 February 2019. ^ "Gianni MORBIDELLI - Involvement • STATS F1". www.statsf1.com. Retrieved 9 February 2019. ^ "Max PAPIS • STATS F1". www.statsf1.com (in French). Retrieved 9 February 2019. ^ Thorn, Dan (7 February 2017). "6 Races Which Show Jos Verstappen Was Pretty Awesome Too". WTF1. Retrieved 9 February 2019. ^ "Ricardo ROSSET - Grands Prix started • STATS F1". www.statsf1.com. Retrieved 9 February 2019. ^ "Domenico SCHIATTARELLA • STATS F1". www.statsf1.com (in French). Retrieved 9 February 2019. ^ "Luca BADOER - Seasons • STATS F1". www.statsf1.com. Retrieved 11 February 2019. ^ "Pedro DINIZ - Seasons • STATS F1". www.statsf1.com. Retrieved 11 February 2019. ^ "Minardi - Seasons • STATS F1". www.statsf1.com. Retrieved 11 February 2019. ^ a b "Forti - Seasons • STATS F1". www.statsf1.com. Retrieved 11 February 2019. ^ "Andrea MONTERMINI - Seasons • STATS F1". www.statsf1.com. Retrieved 11 February 2019. ^ "Roberto MORENO • STATS F1". www.statsf1.com (in French). Retrieved 11 February 2019. ^ "Tyrrell - Seasons • STATS F1". www.statsf1.com. Retrieved 9 February 2019. ^ "ForzaMinardi.com - Giancarlo Fisichella". www.forzaminardi.com. Retrieved 11 February 2019. ^ "Giancarlo Fisichella: Dreams do come true". www.motorsport.com. Retrieved 11 February 2019. ^ "Forti • STATS F1". www.statsf1.com (in French). Retrieved 12 February 2019. ^ "Luca BADOER - Involvement • STATS F1". www.statsf1.com. Retrieved 12 February 2019. ^ Collins, Aaron (6 September 2018). "F1: The Disastrous Story of MasterCard Lola". essaar.co.uk. Retrieved 12 February 2019. ^ Henry, Alan (1995). Autocourse 1995–96. Hazelton Publishing. p. 211. ISBN 978-1-874557-36-4. ^ a b c "New Regulations for 1996". F1 Formula 1 96: A Champion and a Gentleman!. Duke Video. 1996. Event occurs at time 5:47–6:49. ^ "Australia 1996 - Result • STATS F1". www.statsf1.com. Retrieved 14 February 2019. ^ Reiman, Samuel (10 March 2015). "Race of firsts: Remembering the 1996 Australian GP". FOX Sports. Retrieved 14 February 2019.